Home > Services > We do smile designing with INVISALIGN or Clear Aligners which are custom-made for you. The Clear Aligners are virtually invisible and fit snugly over your teeth. Each Aligner shifts your teeth slightly, moving them horizontally and vertically and even rotating them when needed. Your Aligners are engineered to use the right amount of force in the right place at the right time. When you change to the next set of Aligners (typically every 2 weeks) your teeth gradually move into position, following a custom treatment plan mapped out by your doctor. Invisalign can correct many orthodontic problems such as Overcrowded teeth, Gaps between teeth, Simple bite irregularities, Overbites, Crossbites and Relapses after traditional braces have been removed. We do smile designing with INVISALIGN or Clear Aligners which are custom-made for you. 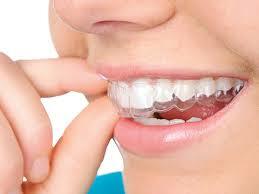 The Clear Aligners are virtually invisible and fit snugly over your teeth. Each Aligner shifts your teeth slightly, moving them horizontally and vertically and even rotating them when needed. Your Aligners are engineered to use the right amount of force in the right place at the right time. When you change to the next set of Aligners (typically every 2 weeks) your teeth gradually move into position, following a custom treatment plan mapped out by your doctor. Invisalign can correct many orthodontic problems such as Overcrowded teeth, Gaps between teeth, Simple bite irregularities, Overbites, Crossbites and Relapses after traditional braces have been removed.